So here's the setup, our main modem is in the living room which comes from the Internet service provider, then I setup a 2nd modem (WRT54G) with an IP of 1.2.3.4. Now if anyone wants to connect to a wired connection it will now be connected to the 2nd modem WRT54G. Now i connected another unused Optical Network Unit let's call it 3rd wifi modem to my 2nd modem and has a IP of 192.168.254.254 which the unit comes from another Internet Service Provider. Here's the problem: The IP of my desktop when connected directly to the 2nd modem is 1.2.3.100. After connecting the 3rd wifi modem to my 2nd modem, the IP of my desktop changed to 192.168.254.X and showing it's connected to 3rd modem when in fact it's directly connected to my 2nd modem. 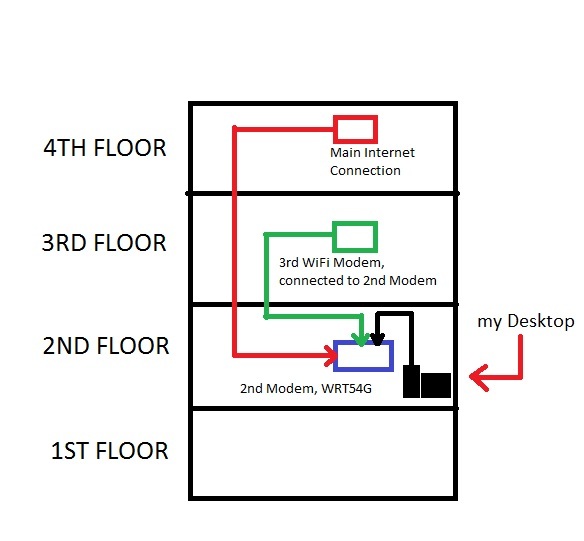 I still want a wired connection via 2nd modem not to be connected to 3rd modem. What should I do? This was completely explained in the answers to your other question. By connecting the two LAN ports together, you turned your network into one LAN. That LAN now has two DHCP servers, so it's unpredictable which routers will assign IP addresses to which machines. If you want to connect two distinct LANs together, you need some device that can connect to two different networks and route between them. To use your existing routers for that, at least one of them would need to connect to three different networks (the WAN and both LANs) which they are not capable of doing with factory firmware. As was already explained, there is no simple way to do this and significant network expertise would be needed to make it work. Perhaps you could use a routing switch or a Raspberry Pi to route between the LANs. Firstly, 1.2.3.0 is not a private range. Don't use it internally. Only one router doing NAT. Easiest way to achieve this is to ignore the WAN ports on the non-gateway routers. Put tape over them so you don't forget. (optional but wise) Static addresses assigned to each router, all from the same range. EG 192.168.1.1 for the gateway, .2 for the 2nd router, .3 for the 3rd. Wired router with wireless as internet source? Can I connect my modem using the arial wall sockets in my house?